All we want for Christmas is this delightfully festive OPI Mariah Carey set! If you don’t want to shed out too much on your talons this Christmas, this set contains all of the staples in handy mini form. Underneath the Mistletoe is our favourite shade – a deep ruby polish infused with pink and red microglitter. Perfect when paired with a snuggly Christmas jumper or a killer LBD, this subtle golden hue will make a great addition to your festive collection. Also looks great when topped with glitter polish for extra sparkle. If you fancy trying your hand at some festive nail art, this is a great starter tool. 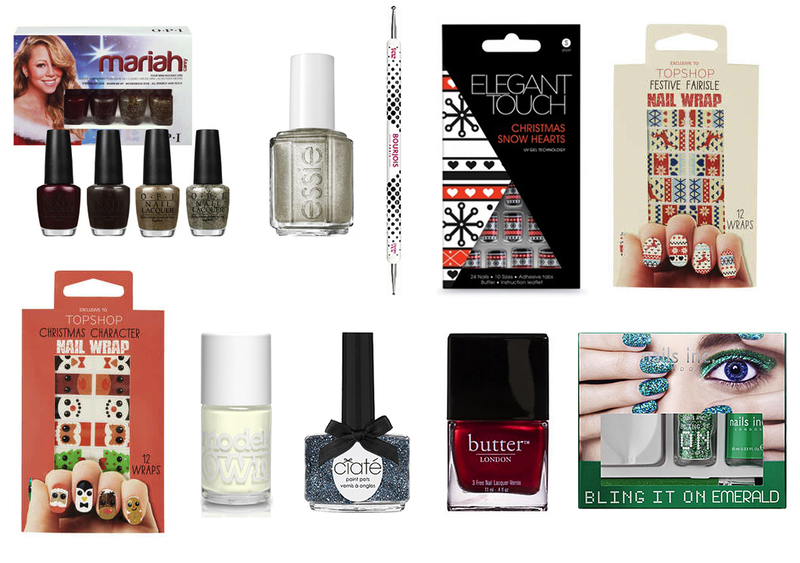 For a simple but fun look why not try some wrapping paper nail art? Try a matte red or green polish as a base and once dry add some white or glitter dots all over. If you have very short nails, these press ons are a great way to add some length and interest. Featuring a red base with snow flakes and hearts, these press-ons are a doddle to apply and will add festive cheer to any look. These Fairisle themed wraps allow you to mix and match designs and are also great for feature nails. We love the look of simple white polish with a ring finger accent nail featuring one of these fairisle wraps. Finish the wrap with a clear topcoat to make it last longer. We really couldn’t decide between these nail wraps and the fairisle jumper version, so went ahead and included both. These wraps are super cute and feature an array of festive critters. Wear all at once or use for an accent nail. White polish looks so chic and can make a refreshing change from the reds and greens of the season. This polish looks wonderful when topped with a microglitter and also makes for a great summer shade. This beautiful silver/blue fine glitter can be built up with multiple coats, or can be layered over another polish for an amazing effect. It looks great over white! If bling is your thing then this one is for you. Encrust your nails with gorgeous emerald green glitter for a truly show shopping festive look. Want to keep things simple? Every girl needs a rich and super shiny red, and this Butter London polish just hits the spot.